If you have recently been diagnosed with skin cancer, you are not alone. Skin cancers often extend beyond their visible borders. It is these extensions that cause the tumors to recur if not completely removed. Like other surgical procedures, Mohs surgery first removes the visible tumor. A thin layer of normal tissue is removed, mapped and evaluated by the surgeon with a microscope. Additional layers may then be taken precisely in the areas of remaining cancer until the tumor is completely removed. Mohs surgery is the only method that ensures all of the tumor is removed while preserving the maximum amount of healthy tissue and therefore minimizing scars and cancer recurrence. Dr. Antonio Cruz is a Board Certified Dermatologist and Fellowship-Trained Mohs Micrographic Surgeon. He performs all aspects of the procedures in 2 dedicated facilities in Providence and Newport. If you have never had the Mohs procedure performed, please contact SkinPros to arrange for a consultation to discuss the procedure. However, if you have had the Mohs procedure performed previously, you have the option of scheduling a phone consultation. Our team is available to answer any questions or concerns at 401-272-2724. Some basal cell carcinomas respond to cryosurgery, where liquid nitrogen is used to freeze off the tumor. The preferred method of dermatologists, this treatment involves using a small metal instrument (called a curette) to scrape out the tumor along with an application of an electric current into the tissue to kill off any remaining cancer cells. The preferred method for large tumors, Mohs Micrographic Surgery combines removal of cancerous tissue with microscopic review while the surgery takes place. By mapping the diseased tissue layer by layer, less healthy skin is damaged when removing the tumor. These creams can be applied at home. They stimulate the body’s natural immune system over the course of weeks. Radiation therapy is used for difficult-to-treat tumors, either because of their location, severity or persistence. In this treatment the tumor is surgically removed and stitched up. Squamous cell carcinoma can develop anywhere, including inside the mouth and on the genitalia. It most frequently appears on the scalp, face, ears and back of hands. Squamous cell carcinoma tends to develop among fair-skinned, middle-aged and elderly people who have a history of sun exposure. In some cases, it evolves from actinic keratoses, dry scaly lesions that can be flesh-colored, reddish-brown or yellow black, and which appear on skin that is rough or leathery. Actinic keratoses spots are considered to be precancerous. While melanoma is the least common type of skin cancer, it is by far the most virulent. It is the most common form of cancer among young adults age 25 to 29. Melanocytes are cells found in the bottom layer of the epidermis. These cells produce melanin, the substance responsible for skin pigmentation. That’s why melanomas often present as dark brown or black spots on the skin. Melanomas spread rapidly to internal organs and the lymph system, making them quite dangerous. Early detection is critical for curing this skin cancer. Melanomas look like moles and often do grow inside existing moles. That’s why it is important for people to conduct regular self-examinations of their skin in order to detect any potential skin cancer early, when it is treatable. Most melanomas are caused by overexposure to the sun beginning in childhood. This cancer also runs in families. 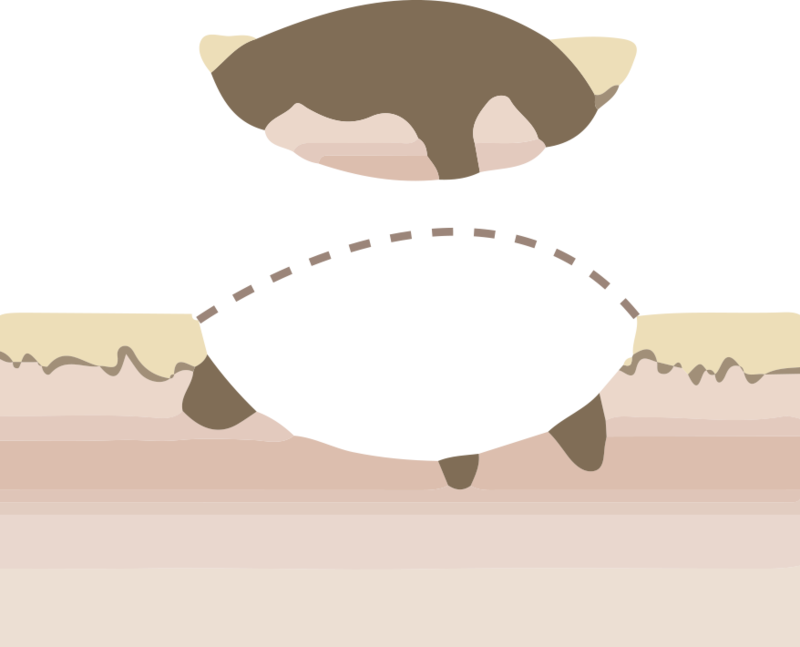 Elevation: The mole becomes elevated or raised from the skin. If any of these conditions occur, please make an appointment to see one of our dermatologists right away. The doctor may do a biopsy of the mole to determine if it is or isn’t cancerous. Irregularly shaped moles that are larger than average. They often appear to have dark brown centers with light, uneven borders. Your dermatologist may consider the removal of these lesions based on how atypical they are. We are equipped to excise these lesions leaving minimal scarring. We will also send the specimen for testing to ensure it has been removed in its entirety.